Ever since my trip to North Texas RPG earlier this summer I've been wanting to pick up something from Hydra Cooperative to review, not knowing I had already reviewed one of their adventures. A week or two ago I noticed the Hill Cantons Compendium II was not only PWYW, but also had a softcover B&W book available. While the PDF is PWYW I do believe there is a minimum price to get the softcover.....the printing and shipping doesn't pay for itself! This review will kind of cover both items. They are far more similar than they are different, as one would expect. This supplement seems to be geared more for old-school Basic D&D, but really it is filled with tweaks that can be further tweaked for any OSR game. The PDF is 1.93 MB in size, secured, and comes in at 21 pages without a back cover. It is a full-sized PDF at 8.5" x 11" (US Letter) that unfortunately lacks any bookmarks or a Table of Contents. The print version was delivered quickly and was overly protected by a large cardboard "shield" that wouldn't fit in my mailbox. I'm sure the mailman hated having to bring it to my door, but all this effort gave me a pristine copy to read & enjoy. There isn't a Table of Contents in the print edition either, which is a shame because there was definitely room. Very generally speaking books get printed in page multiples of four and IIRC One Bookshelf's printer requires a single blank page at the end. With the insertion of a back cover and the blank "pages" that are the inside covers there were three blank pages at the end. A blank page after the title page and then a Table of Contents would have been easily accommodated. Now I think the B&W printed pages look great, but I pretty much missed any grey contrast in the various tables in the book. I only noticed any shading when I specifically looked for it after comparing the print version and PDF version side-by-side. The 1st two pages of the Hill Cantons Compendium II is filled with background information on a campaign setting that I pretty much ignored. I don't know if this builds upon an earlier supplement (Hill Cantons Compendium I maybe?) or is intended to mesh with something else, but I thought it was pretty much a waste of space.....on its own. Two pages of background detail without a map isn't a lot. Most named-places have single sentence entries......I just don't know what to do with this, so it gets skipped. 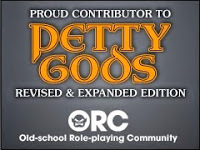 The bulk of this supplement, the reason I wanted a physical copy, is dedicated to presenting not only new PC classes, but also a nifty new way to generate PCs. The nine new classes, I think, are worth a look, and I'm a HUGE fan of the Alternate Character Generation System. I think next time I'm going to run a BX game instead of making pregens I'd input these tables into on of my table generators and have it spit out half-way made pregens that the players could easily "top-off" in a few minutes. Coupled with the news classes....I think that game would be fun. 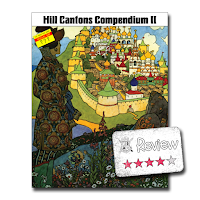 Overall I really like Hill Cantons Compendium II and think it is well-worth your time. At the price of PWYW.....you should definitely pick it up!